After a 6 month winter break, the PWA World Tour is back for 2019 and this time around the World’s best freestylers will have the honour of raising the curtains on this year’s tour as they return to the spiritual home of Freestyle - Bonaire for the first time since 2014. 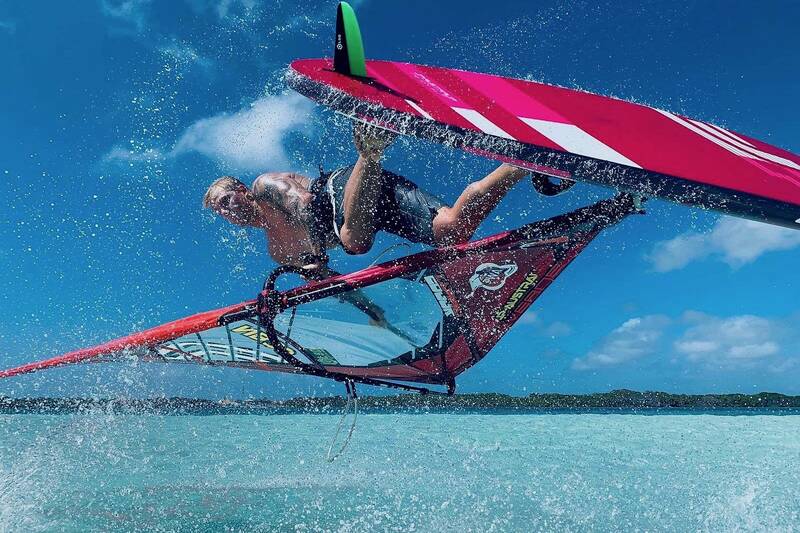 Sorobon beach will take centre stage over the next 5 days as the contortionists of the windsurfing world prepare to battle it out of the at the FORSA Bonaire PWA World Cup between 9th-13th April and the action promises to be off the scale looking at the latest forecast. Bonaire is part of the ABC Islands - Aruba, Bonaire and Curacao - which has consistently produced some of the best freestylers in the world, is located off the north coast of South America, approximately fifty miles north of Venezuela. Situated just outside of the Hurricane Belt, Bonaire benefits from consistent trade winds, which when combined with the crystal clear, mirror flat water of Sorobon produces the perfect playground for freestylers to unleash their most mind-blowing moves. Add to this the laid back Caribbean lifestyle and stunning scenery and you start to understand why this quickly rates as one of the best spots in the world for windsurfing. Sarah-Quita Offringa (Starboard / NeilPryde / Maui Ultra Fins) will begin the new season striving to win an unprecedented 12th PWA Freestyle World Championship in succession, and 16th overall. The 27-year-old is unbeaten on the Freestyle circuit for the last 11 years and remains the undoubted favourite heading into the season opener with her blend of the latest power moves, style and unbelievable consistency making her extremely difficult to oppose. However, in recent years both Maaike Huvermann (Starboard / Severne / Maui Ultra Fins) and Oda Johanne (Starboard / Severne / Maui Ultra Fins) have been raising the bar themselves and it would seem that if anyone is to stop Offringa in Bonaire it will be one of these two girls. In 2017 Huvermann showed she has the potential to truly trouble Offringa as she forced the Fuerteventura PWA World Cup into a Super Final, but eventually just lost out. The 21-year-old has been studying full-time recently though, so whether she has had enough time on the water to trouble Offringa this time around remains to be seen. Huvermann and Johanne were almost inseparable last season and there will surely be another hard fought battle ahead for 2019. The Norwegian has not finished outside the overall top 3 for the last 5 years and has been in Bonaire prior to the event to make sure she’s perfectly prepared for the first event of the year. Of course, Arrianne Aukes (Fanatic / Duotone / Maui Ultra Fins) will also be a threat for the podium, but her winter preparations were slightly hampered by a shoulder injury. Aukes finished 2018 ranked 4th overall and will no doubt be trying to pull off every trick in the business to earn her first Freestyle podium since the last time there was a PWA event here in Bonaire, 2014. Meanwhile, Johanna Rümenapp (I-99 / Gun Sails) will be looking for her first top 4 finish in her second season on the world tour. The 24-year-old has an ideal platform to build upon after a solid debut season, which saw her finish 5th overall. The women’s fleet is currently completed by Italian Francesca Flores, Bonairean Angela Koch, Poland’s Julia Pakosz, Suisse Eva Wyss and Dutch 23-year-old Jazzy Zwerus (JP / NeilPryde). Can a Home Grown Talent Win? Over the years Bonaire has produced some of the best Freestyler talents in the World and still continues to do so, so the home crowd will have their hearts pinned on seeing one of their local heroes crowned champion on home waters. There is a myriad of homegrown talent on offer, but the main hope will probably fall on the shoulders of Amado Vrieswijk (JP / Severne), who has developed into a serious title contender over the last few years with his powerful and progressive sailing putting him on the cusp of a maiden world title on a couple of occasions. Maybe an event at home in Bonaire can be the catalyst for the 23-year-old to finally get his hands on the coveted top prize. Alongside Vrieswijk will be fellow Bonairean’s Tonky & Taty Frans (Point-7 / Shamal Sunglasses), Youp Schmit (I-99 / Avanti), 2013 PWA Freestyle World Champion - Kiri Thode (Severne / Severne Sails) - who has reportedly rekindled his passion and desire to compete against the best in the world, but after a couple of seasons away it will be interesting to see how he fairs. Incidentally, Thode is also the defending event champion from 2014. Reigning world champion Jose ‘Gollito’ Estredo (Fanatic / Duotone) will come into the event on paper as the favourite having won the last 3 events, but he will face a stern test to make the perfect start to the season with the chasing pack getting closer and closer to the 9-time world champion each year and in 2014 the Venezuelan ‘only’ finished 5th here after two double eliminations. However, Gollito is not only an incredible showman who oozes style, but he is also an unbelievable competitor who loves the taste of victory and it wouldn’t be a surprise to see him standing on top of the podium come the end of the week. Teammate - Adrien Bosson (Fanatic / Duotone / Maui Ultra Fins) - was Gollito’s closest challenger last year with the Frenchman pushing the Venezuelan to a sail off for the world title in Sylt. Bosson will come into Bonaire full of confidence off of the back of his best season ever (vice-world champion), but it’s probably fair to say both he and Gollito prefer stronger winds and wavier Freestyle conditions than usually found in Bonaire. So, he certainly can’t be ruled out given how well he sailed last year, but his best performance(s) may come a little later in the year. Next in line to challenge will be the Belgian contingent of Yentel Caers (I-99 / Point-7) - who hasn’t finished outside the overall top 4 for the last 3 seasons, Steven van Broeckhoven (Starboard / Gun Sails) - who after few years dogged by injury was finally able to show what he is still capable of in 2018 - finishing 5th overall, while fellow former world champion Dieter van der Eyken (Severne / Severne) finished 7th overall last season despite focusing his attention much more on the wave scene and very much knows how to win. Over the last couple of seasons Jacopo Testa (RRD / RRD Sails / AL360) has taken his competition sailing to another gear, which has seen the highly talented Italian rewarded with 3rd and 6th places in the overalls for 2017 & ’18 respectively, which certainly makes him a player in the opening event of the year. Sam Esteve (JP / NeilPryde) will also be a very real threat in Bonaire. The 21-year-old loves flat water and has all of the combinations needed to be in contention to challenge for the podium. Elsewhere, keep an eye out for the likes of Mattia Fabrizi (Patrik / Sailloft Hamburg), who finished in the overall top 10 for the first time last season - 9th, the radical and sometimes crazy Balz Müller (MB-Boards / Severne), who completed the top 10 last year. There will also be a few sailors looking to hit back this season such as the French pair of Nicolas Akgazciyan (JP / NeilPryde / Maui Ultra Fins) & Antony Ruenes (Tabou / GA Sails), who finished 14th and 16th overall in 2018, but have been more accustomed to battling it out in the latter stages of the contest. The depth of talent on the PWA Freestyle World Tour is incredibly high at the moment and with the fleet reduced to just the top 32-men things are about to get even tougher right from the very first round. And as a result, almost anyone is capable of beating anyone on their day, which should make for an intriguing first competition. Expect to see mind-boggling variations and possibly some new combinations thrown down over the next 5 days in Bonaire’s idyllic freestyle playground. The current forecast looks superb with Bonaire’s trade winds looking like they will deliver the kind of conditions we’ve been craving. With a brilliant forecast on offer you aren’t going to want to miss any of the action, so make sure you tune into www.pwaworldtour.com to watch all of the explosive action as it happens.